Nathan Moore was recently interviewed for an A&S podcast about his experiences with the Schomburg-Mellon Humanities Summer Institute. Listen here, and read the story below. Originally from Indianapolis, Nathan Moore and his mother moved to Louisville when he was around 12. Growing up on both sides of the Mason-Dixon Line, Moore is somewhat conflicted as northern southerner, or is that southern northerner? Regardless, one direction that Moore is certainly moving is up. 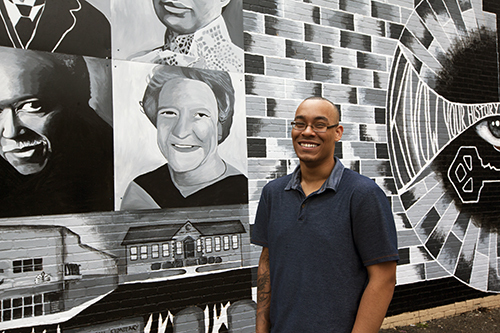 The UK Junior was recently named a fellow for the Schomburg-Mellon Humanities Summer Institute in New York City, and as one of only 10 recipients to be bestowed that honor, it is helping to further define who Nathan Moore is and who he is quickly becoming as an academic. “Being accepted into this fellowship is not only a prestigious and exciting opportunity, but it also serves as a great validation of all the hours I have spent working so hard in and outside of the classroom,” Moore said, who is majoring in English with a minor in African American & Africana Studies. Instrumental in Moore’s success has been Assistant Professor Damaris Hill – who began to mentor him after she was impressed by his insightful commentary and writing in one of her courses. It was Hill that brought the fellowship opportunity to Moore’s attention and helped him during the application process. “He is a talented student that offers unique perspectives of about American/African American literature, particularly the intersections between African American literature and notions of the fantastic in marginalized cultures,” said Hill. The fellowship was created to encourage minority students and others with an interest in African-American and African Diasporan Studies to pursue graduate degrees, and it’s a path that Moore is focused on. “I am totally planning on going to graduate school to pursue an MFA and then most likely a Ph.D. My research, which I will be pursuing more fully at the Schomburg this summer, centers on early African American Literature, particularly slave narratives, and the visionary qualities of those texts. **The mural that is featured in the photos is entitled "Know Your History" and is in the East End of Lexington at 3rd Street and Race. The artist, Sundiata Rashid, who resides in the East End neighborhood, tied the past and present together while also including significant neighborhood buildings. Half of the mural is black and white…depicting the past…and the other half is in color and represents the future.